While watching the football game Friday afternoon, then later in the evening some other tv with the family, I managed to do this zentangle for my niece in a Roller Derby theme. Hoping to give it to her framed on Saturday at my great nephew's birthday party, I was disappointed to see that again I had made my image too large. It is almost 11 inches wide....I must mark my boundaries in order to have it fit an 8x10 frame opening...now it will not work in my favorite frame for zentangles! OK, I will punt, have a mat cut to fit and put it in a 11x14 frame. Had a nice long weekend with the family, Mr. U, BigBoy and VolleyGirl went to see "Blind Side" last night, it is a good movie. The Christmas extravaganza is almost complete in the front of the house and I kept washing through out the days so I am not far from being caught up. I have tomorrow free, then start work Tuesday. I have a few errands for tomorrow. Hope you all have had a great weekend! 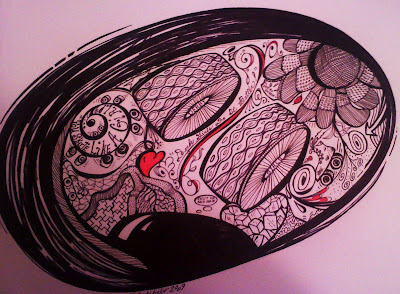 I am sure your niece will like her zentangle even though it isn't the correct size. I really like it. I have the same sometimes that I make something and then I can't find a frame or passe partout....... maybe the other way around? Byuy the frame first but it doesn't work that way. Good luck on your new job! It will be a busy month for you, the holydays and so many new impressions.........Take care! This came out so well. You really have to enlarge it to really see it all. She should love it. I heard that 'Blind Side' was good too and a true story. Sounds like you are getting caught up on things around there. Hope the new job fits in with your busy schedule. I like this zent. Maybe you can find a new, bigger frame for this one. Bigger is better! Hope you like your new job. Good luck. It will be a change for you to be going to work now. Welcome to the ranks of the employed! Its so intricate. Love the piece. Hope you've a gr8 time with your job. Doodles are so intriguing. I'm sure your niece will love it! The skyscape in the last post is breathtaking.